Kitty Hawk Kites has been “Teaching the World to Fly” at Jockey’s Ridge for over 45 years. Learn to hang glide with Kitty Hawk Kites, and you will be flying on the first lesson. If you want to work on advancing your training, you can progress toward getting your “Hang 1” pilot rating. Jockey’s Ridge is also a fantastic place to fly a kite, go sand boarding or catch a famous Outer Banks Sunset. Stop by Kitty Hawk Kites at Jockey’s Ridge Crossing (MP 12.5) for details or call 1-877-FLY-THIS (877-359-8447). While the sand dunes are certainly the biggest and most noticeable attraction in Jockey's Ridge State Park, there are actually acres of outdoor activities to explore in this diverse recreational area, from kayaking to kiteboarding, hiking to just soaking up the sun. With extensive nature trails, an easily accessible soundside beach, and virtually every type of sport an Outer Banks vacationer can enjoy on the water or the land, Jockey's Ridge State Park is one Nags Head destination that is sure to offer a little something for everyone in the crew, and will keep the entire family smiling and happily entertained. The formation of the sand dunes that make Jockey's Ridge State Park a famous Outer Banks destination took thousands of years, and even today, these massive dunes are still changing and shifting in miniscule increments. Geologists theorize that the dunes were initially created when storm surges from a series of storms and hurricanes pushed large offshore shoals onto the beach, which was eventually pushed inland by centuries of consistent winds. Over time, the sand accumulated leaving the tall dunes that are standing today. The dunes may look like they could blow over any moment, but underneath that initial powdery layer of sand lies a dense and wet solid surface, held together by constant moisture from rain. The sand ridge that formed over the centuries has seemingly been present as long as there have been settlers on the Outer Banks. The long dune ridge was a landmark of sorts for early Spanish and French explorers, and served as one of the initial oddly natural attractions for the Outer Bank's earliest visitors in the early and mid-1900s. The origin of its name has led to decades of legends and locale speculation, the most popular theory being that the early settlers would capture wild ponies, and race them along the flat bases of the sand dunes, with spectators watching the show from the tall dunes overhead. As a result, the area was named after the jockeys who participated in these races, creating the moniker Jockey's Ridge. As development blossomed in the central Outer Banks however, the area bordering the sand dunes became a very desirable locale for new vacation home communities, and developers began to make plans for a new community along the base of the massive dune structure. A local family, headed by Carolista Baum, noticed a bulldozer paving away portions of the sand dune in 1973, and frantic efforts were made to stop the new developments. 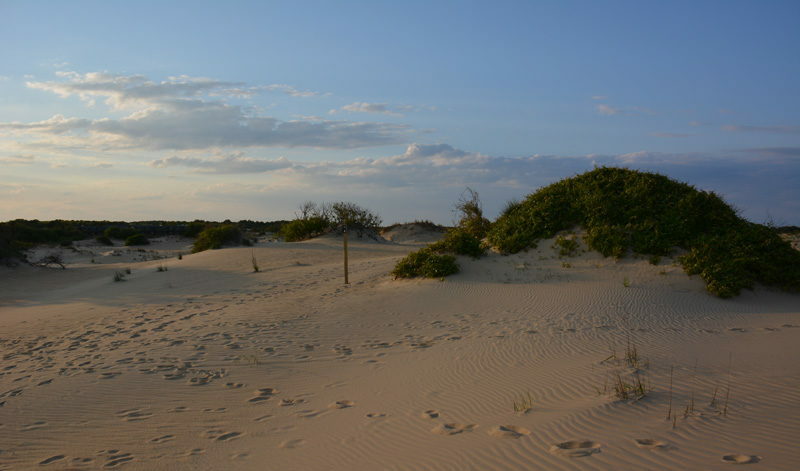 The People to Preserve Jockey's Ridge was formed, consisting of concerned locals and officials, and petitions were made to the state and local governments to protect the dunes from new encroaching communities. Thanks to their efforts, the Division of Parks and Recreation stepped in to lend their support, and in 1975 the General Assembly set aside money to create the now famous Jockey's Ridge State Park. The state and matching federal monetary contributions allowed 152 acres to be purchased and set aside as a state park. The Nature Conservancy joined in the efforts and purchased an additional 100 or so acres, and today, Jockey's Ridge State Park comprises of a whopping 420 acres, which span from the edge of the coastal dune ridge to the borders of the Roanoke Sound. Still a marvel to modern vacationers as it was to the Outer Banks' first settlers, Jockey's Ridge State Park is an impressive Nags Head treasure that still serves as a legendary local landmark. The biggest attraction at Jockey's Ridge State Park is quite literally the ancient sand dunes, and generations of vacationers have discovered new and ingenious ways to have fun while sitting on top of the world. Many folks simply make the long and tricky trek to the very top to enjoy views that span from the Roanoke Sound to the edge of the Atlantic Ocean. Not for the faint of heart, this trip requires comfy shoes, a little stamina, and a lot of water, especially in the warm summer months. Not surprisingly, the dune-top area has also become nationally recognized as one of the top hang gliding locations on the East Coast. With literally no obstructions at the top, and a completely scenic ride from the 100' ft. plateau to the bottom of the ridge, the Jockey's Ridge State Park dunes have been a popular hang gliding launching point for well over 50 years. Classes are offered from neighboring Kitty Hawk Kites for hang gliders of all ages and skill levels, and adventurous vacationers will be happy to discover that a two hour lesson easily produces the ride of a lifetime. One of the newest sports to pop up along the sand dunes is sand boarding. Combining the principals of surfing and snowboarding, sand boarding is allowed at the park in designated areas in the off-season, generally from October 1 - March 31. A permit must be obtained beforehand from the park office, and parents must give their permission for boarders who are under 18. Slightly dangerous but a truly exciting adventure, sand boarding is gaining popularity with off-season surfers and skaters on the hunt for a new way to enjoy an Outer Banks thrill ride. Just past the sand dunes, nature lovers, birders and hikers will find three different nature trails that wind through the park and are open for visitors of all seasons to explore. The Tracks in the Sand nature trail is the longest at 1.5 miles, and is an easy-going trail that leads visitors over the sand dunes, all the way to the Roanoke Sound borders, and back again. Along the way, visitors will encounter patches of maritime forests, shrub thickets, and endless seaside views. Sturdy shoes, sunscreen and bottled water are all but required, and along the way, visitors will enjoy gorgeous landscapes and an in-depth look at the fragile dune environment as well as the plants and wildlife that call it home. The Soundside Nature Trail is a slightly shorter expedition, and is a 1 mile loop that begins at the soundside park entrance and parking area, and leads visitors through the marsh and estuary ecosystems of the park as it approaches a scenic overlook. This is a gorgeous stroll through small patches of woods and shrub thickets, and in the summer months, visitors should be sure to bring along bug spray to relax and enjoy the scene without the distraction of swatting away those pesky local mosquitos. 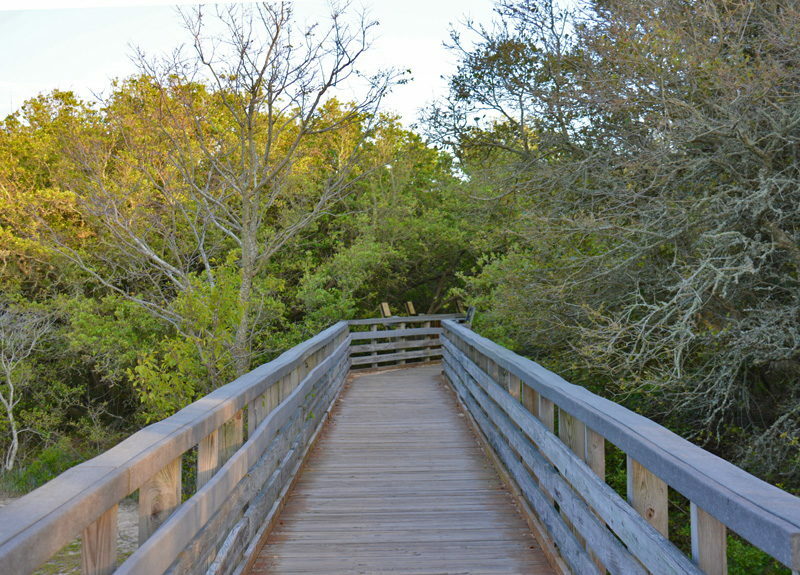 The third trail is a small 384' ft. boardwalk that is located close to the main entrance parking lot, and allows visitors to enjoy a shorter trip off the sand. The boardwalk features small displays pointing out the local animals and plants that can be spotted nearby, built-in wooden benches, and is also handicapped accessible ensuring everyone can enjoy the park facilities. An Exhibit Hall is also located near the entrance, and features extensive displays on all the species that visitors can find at Jockey's Ridge State Park, as well as the origins of the famous sand dunes. Discover more about the history of Nags Head and Kill Devil Hills, (as well as the unique history behind their unusual town names), as well as the local settlers who first settled along the sand ridges. National Park interpreters are on hand to answer questions, issue permits as needed for special park activities and events, and even provide seasonal park programs that explore the park further, from the animal tracks that can be found skirting along the blank sand canvas to the incredible plant species that are only found in unique coastal environments like those on the Outer Banks. Watersports lovers will also love an expedition to Jockey's Ridge State Park, as the soundside parking area provides easy access to a wide, soundfront beach with plenty of room to enjoy your sport of choice. This beach serves as a convenient and ideal launching point for kiteboarders, windsurfers, kayakers and even stand-up paddle boarders, with miles of open sound waters extending past the park's borders. The beach also provides ample splashing grounds for young children, with gently lapping sound waves and a shallow and gradually sloping bottom. Little kids who love to swim and play in the waves, but aren't quite big enough to tackle the ocean breakers, will find the soundside beach at Jockey's Ridge State Park the perfect shore-side playground. Jockey's Ridge State Park can also serve as a romantic spot for picnics and sunsets, either along the water's edge on the soundside beach, or from the very top of the dunes. Though the park is seasonally open with hours of operation ranging from the winter to the summer months, and typically shuts down in the evening hours, there are special programs available for free for visitors who want to catch an incredible sunset from the top of the sand dunes. Clearly, no matter what a vacationer's age or outdoor activity of choice, Jockey's Ridge State Park offers something for everyone. Try out an afternoon of hang gliding for an incredible high flying adventure, or simply take the youngest members of the family to the beach for a fun day of splashing in the saltwater. Those ancient sand dunes might be the most noticeable attraction within the park, but they're bordered by acres of fun adventures and activities just waiting to be discovered. The park's hours of operation vary by both season and area of the park itself. The visitors' center is open in the winter months from 9:00 a.m. to 5:00 p.m., and is open the rest of the year from 9:00 a.m. to 6:00 p.m. The soundside access gate is open in the winter, early spring and late fall from 8:00 a.m. to 5:00 p.m., and is open in the summer and shoulder seasons from 8:00 a.m. to 7:00 p.m. The main entry, which includes access to the sand dunes, is open from 8:00 a.m. to 6:00 p.m. in the winter, 8:00 a.m. to 8:00 p.m. in the spring and fall months, and 8:00 a.m. to 9:00 p.m. in the summertime. Please note that the dune ridges close 15 minute prior to the park's closing time to ensure everyone is able to get safety downhill before the park closes. There is no fee to access the park, except for special events or requests that may require an additional permit, and within the grounds park visitors will find public restrooms, picnic shelters, and a number of interpretive displays along the nature trails pointing out the local flora, fauna and wildlife. The 384' ft. boardwalk that borders the main entrance and the sand dunes is handicapped accessible, and transportation to the top of the dunes is often available during the day, before 4:30 p.m., to visitors who need assistance. Visitors who may require this service are urged to contact Jockey's Ridge State Park ahead of time to ensure transportation will be available. Pets are allowed in the park, but must be kept on a 6' ft. leash at all times, and are not allowed in "indoor" areas, such as public restrooms or the visitors' center. Please clean up after your pet, and be sure they have a current rabies vaccination before entering the park. Alcohol, fireworks, and guns are not allowed in the park. In addition, park attendees may not camp or have beach bonfires at Jockey's Ridge, and all park patrons are advised to be mindful of trash and litter. Be sure and bring everything out that you take in, and simply follow the local standard rules and regulations, and it's a safe bet that everyone in your party will have a fantastic time. Be sure and check out the extensive free programs that are offered for Jockey's Ridge State Park visitors of all ages. These programs are available throughout the year, but occur on a nearly basis during the summer months of June, July and August. Free activities include a "Tracks in the Sand" exploration of the animal tracks found along the dunes, an evening "Sunset on the Ridge" which features a brief introduction to the coastal dune ridge environment, and a "Crabby Clinic," designed for kids and adults alike who always wanted to learn how to reel in those tasty Outer Banks Blue Crabs. For a complete list of upcoming programs, visit the park's website, or simply stop by the visitors' center for a current schedule. Programs are generally open to everyone, but certain sessions may only accommodate a select number of people, which are admitted on a first come, first serve basis. Spring, summer and fall visitors should definitely bring along the bug spray for their visit to Jockey's Ridge State Park. While the tops of the dunes remain lightly breezy, and therefore fairly mosquito free, the nature trails and ridge borders can be a different story, particularly along the estuary, soundfront beach, and salty marshes. Ticks can also make seasonal appearances in the wooded areas of the OBX, so visitors are encouraged to do a quick "tick check" before leaving the park. Make sure you check the weather report before heading to the dunes. The Outer Banks is known for its beautiful but dangerous summer lightning storms, and the dunes close to the public when a lightning storm approaches to ensure visitor safety. A warning siren will indicate the approach of a lightning storm for park visitors, to ensure everyone is able to safely leave the tall dune ridges before the storm arrives. Be sure and bring sturdy shoes for exploring. The sand along the dunes can be up to 25 or even 30 degrees hotter than the air temperatures, so be sure and protect your feet accordingly. In addition, a little sunscreen might come in handy, as the Outer Banks sun reflected off the water is especially strong, even 100' feet in the air. Don't leave the camera behind! The view from the top is simply incredible, and virtually every portion of this park is a scenic destination that is photo-worthy, especially around sunset when the sun dips into the open Roanoke Sound waters. Forgot to bring the beach toys along? A small shopping plaza is located across the street and features everything from ice cold drinks to kites, ideal for playing with at the top of the dunes. Enjoy a little window shopping or a refreshing break from the sun right across the street at this plaza. A crosswalk with a stoplight makes accessing these shops even easier, as visitors can simply hop across the beach bypass without fear of incoming traffic. 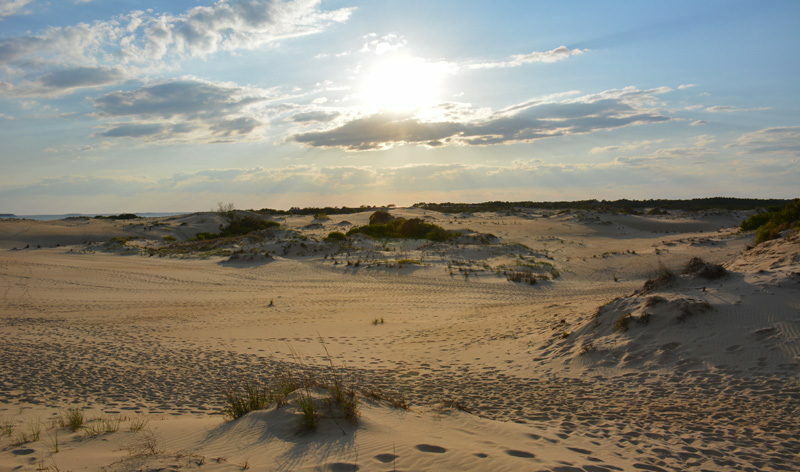 Jockey's Ridge State Park may be best recognized as home to the ancient sand dunes which tower over the Outer Banks. The tallest and most prestigious on the East Coast, it's no wonder that this park attracts hundreds of thousands of visitors every year for an up-close look at one of the most prominent coastal dune ridges on the Eastern Seaboard. 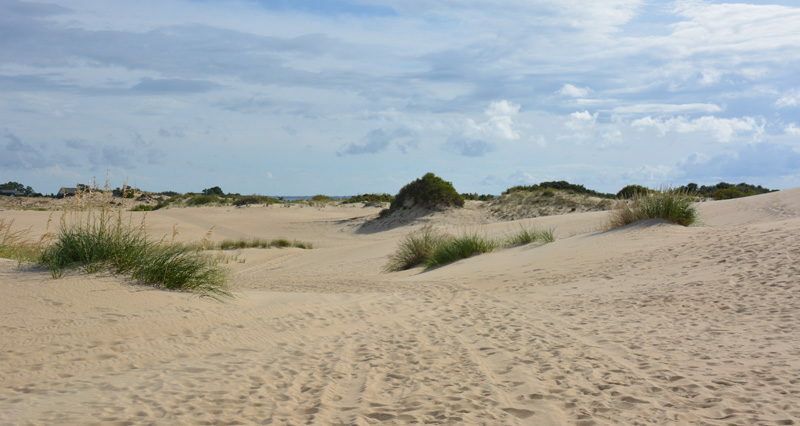 Clearly, these sand dunes are a must see for Outer Banks vacationers, but delve a little deeper and you'll find a fantastic state park that has everything an outdoor loving vacationer could ask for. From exceptionally scenic nature trails to miles of Roanoke Sound to explore, Jockey's Ridge State Park is sure to please every great outdoorsman in your family, as well as the budding biologists, sunbathers, and beach bums. Set aside an afternoon or a whole day, and dedicate some time to exploring this exceptional park, from the soundside beach to the top of the sandy ridge, and you'll see why the view from the top remains one of the Outer Banks' most treasured attractions. Where is Jockey’s Ridge State Park? Jockey’s Ridge State Park is located in the town of Nags Head on the Outer Banks, and is across from the Kitty Hawk Kites flagship store along US 158 or the “Beach Bypass.” It is easy to recognize due to its towering sand dunes, which are the largest on the East Coast. Why is it called Jockey’s Ridge? Though there are a lot of theories about the origin of the name “Jockey’s Ridge,” many historians believe that at one point a family named Jacock or Jackey owned the area, and the name evolved from there. The name “Jockey’s Ridge” dates back as early as 1753, where it first appeared in a written land grant to John Campbell. How tall are the sand dunes in Jockey’s Ridge State Park? The sand dunes at Jockey’s Ridge State Park can reach up to 100’ feet tall, and are the tallest sand dunes in the Eastern United States. How old are the sand dunes at Jockey’s Ridge State Park? 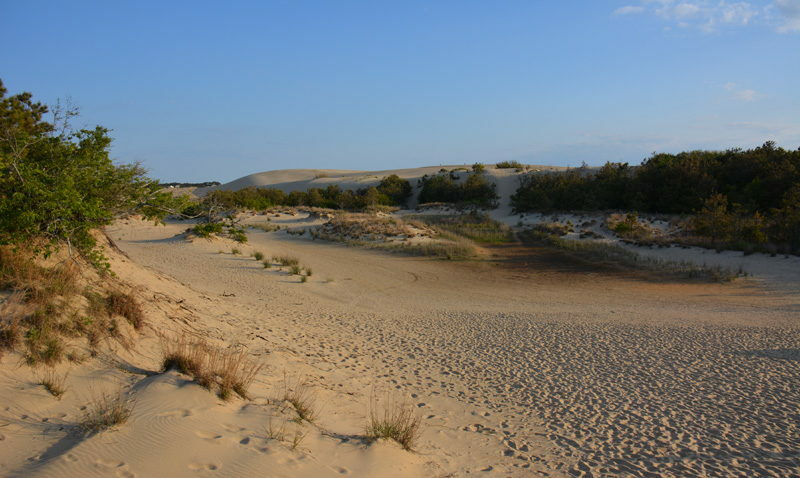 Scientists believe that the sand dunes at Jockey’s Ridge State Park are roughly 7,000-12,000 years old, and are remnants of the last ice age. What is there to do in Jockey’s Ridge State Park? Jockey’s Ridge State Park is a popular destination for hang gliding and flying kites, sand boarding, hiking, birdwatching, swimming, kiteboarding, kayaking, and windsurfing. The park has multiple hiking trails and boardwalks, a soundfront access point, and an Exhibit Hall with information on the history, wildlife, and uniquw landscape of Jockey’s Ridge. How can you hang glide in Jockey’s Ridge State Park? 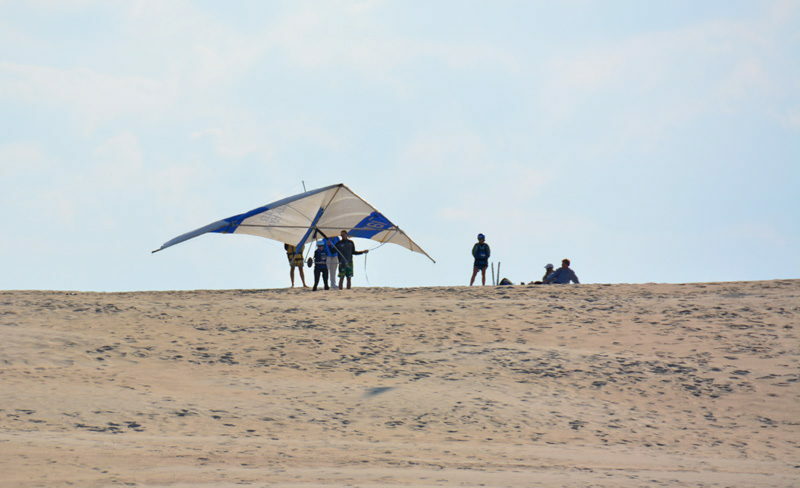 Hang gliding is a popular activity at Jockey’s Ridge State Park. 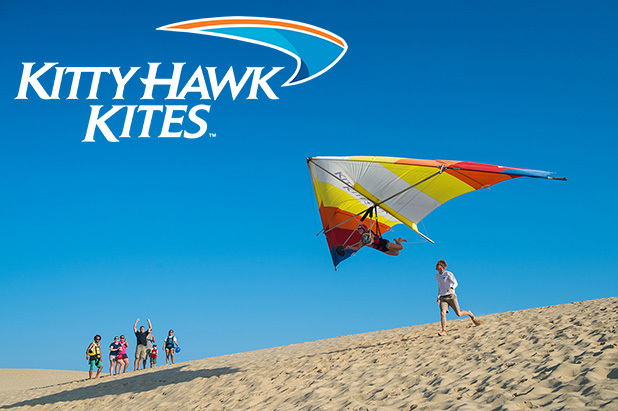 Lessons and equipment rentals are available through a number of local Outer Banks companies, including Kitty Hawk Kites which is located directly across the Beach Bypass from Jockey’s Ridge State Park. Can you fly kites at Jockey’s Ridge State Park? Jockey’s Ridge State Park is known as one of the best places on the Outer Banks to fly kites. Can you bring pets to Jockey’s Ridge State Park? Pets are allowed at Jockey’s Ridge State Park, but are not allowed inside the park’s buildings. Pets must be on a leash no longer than six feet at all times, and visitors are asked to clean up after their pet. How do you get to Jockey’s Ridge State Park? Visitors can easily reach Jockey’s Ridge State Park via US 158 / the Beach Bypass which extends through the central Outer Banks. 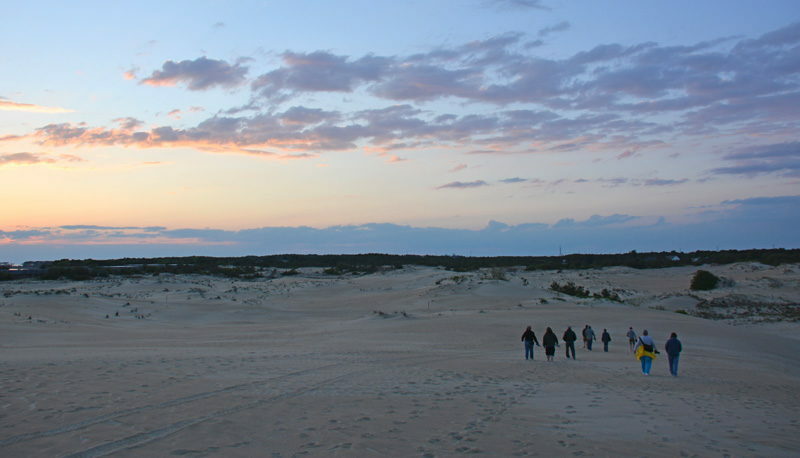 Can you camp in Jockey’s Ridge State Park? Overnight camping is not allowed at Jockey’s Ridge State Park, as it is a daytime-use park only. Where do you park at Jockey’s Ridge State Park? Parking is available near the entrance of Jockey’s Ridge State Park on Carolista Drive in the town of Nags Head. There is additional parking next to the Albemarle Sound at the end of Soundside Road. Where is the water access at Jockey’s Ridge State Park? A soundside access gate is located along Soundside Road in Nags Head, and is generally open during daytime hours all year long. Can you hike at Jockey’s Ridge State Park? 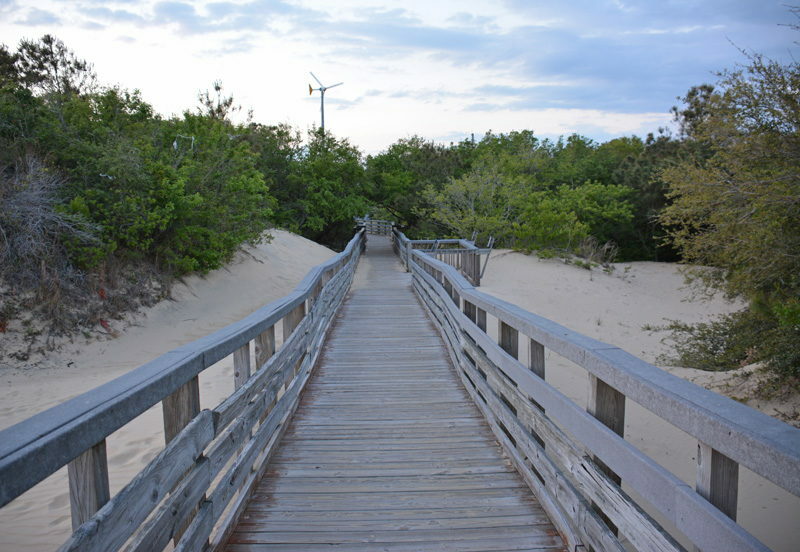 There are three nature trails within Jockey’s Ridge State Park, which include a 1 mile soundside nature trail, a 1.5 mile “Tracks in the Sand” trail over the dunes, and a 360’ ft. boardwalk and observation area. Where do you stay near Jockey’s Ridge State Park? There are a number of vacation rentals that border or are within walking distance of Jockey’s Ridge State Park, which are available to rent through Outer Banks property management companies. In addition, the town of Nags Head is home to several hotels and motels which are close to Jockey’s Ridge State Park. Are there any events at Jockey’s Ridge State Park? 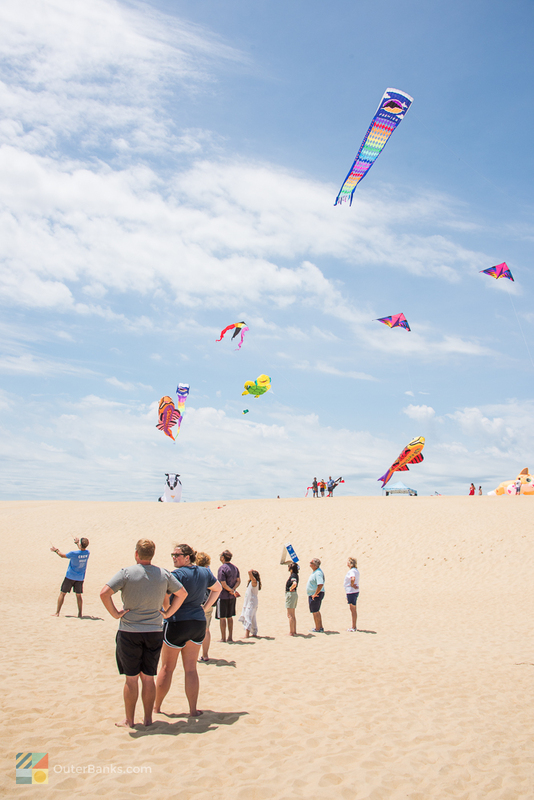 Jockey’s Ridge State Park hosts a number of events throughout the year, including an annual kite festival, a holiday themed “Kites with Lights” festival, and regular educational programs for seasonal visitors. Is there a fee to visit Jockey’s Ridge State Park? There is no fee to visit Jockey’s Ridge State Park. Call 252-441-7132 for current hours.